Shot on a Sunday, this tree is in a lane near my house. I had shot it earlier but looked bland till I noticed the two cars flanking it. An amazing root structure on the trunk of this tree. This is the 'pipar' tree. 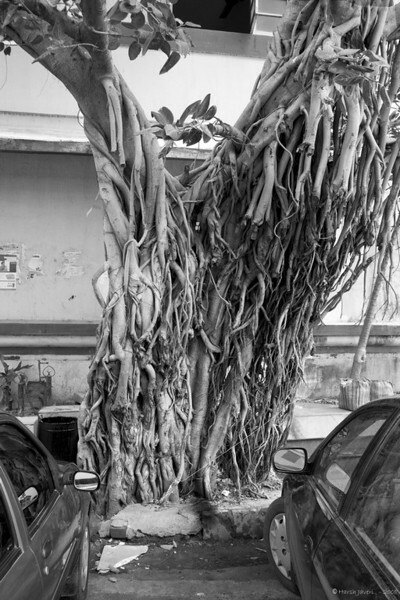 Looks like the banyan but the aerial roots hug the trunk of the main tree unlike the banyan tree where the branches too let down aerial roots far away from the main trunk. Hershy, That's a neat old tree. What kind is it? Are those "air roots" coming from it? Do they grow commonly in India? Great picture. Turning this to B&W has enhanced the image so well! This is a lovely composition. The old tree with the two modern cars on both sides. What a nice tree! I think Rick summed it up!